The bloc’s inability to craft a united response to Chinese aggression signals a further decline in its regional clout. As ASEAN wound up its annual meeting in Naypyidaw with the usual round of backslapping and handshakes, Thailand was again close to political implosion while Vietnam’s navy faced another Chinese incursion in waters not far from Danang. Not much was said about Brunei’s introduction of Sharia law and punishments that range from the stoning of adulterers, gays and apostates to lopping the limbs off thieves. Hard-line Muslims are pushing for something similar in Malaysia, which has been embarrassed by its fumbled response to the disappearance of Flight MH370. Neither a ruthless crackdown on dissent in Cambodia nor a massive borrowing binge in Laos rated much of a mention among ASEAN leaders. Little mention was made of a serious economic crunch in Vietnam, which alongside the Philippines is providing the international bulwark against China’s extraordinary nine-dash line declaration. Enthusiasm for ASEAN, and in particular the launch of the ASEAN Economic Community (AEC) at the end of 2015, has been waning, particularly among heavyweight members like Indonesia. This lack of interest in ASEAN affairs, and a willfully blind attitude to the more weighty issues of state, could not have come at a worse time. The Thais had been tasked with negotiating a code of conduct between China and ASEAN over Beijing’s “ancient claims” in the South China Sea – also known as the West Philippines Sea and East Sea in Vietnam – as gunboat diplomacy between Hanoi and Beijing reaches its most dangerous levels since 1979. Ancient claims have no basis in international courts, but Beijing is relentless in its territorial ambitions. 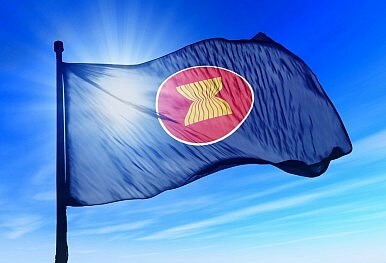 It is also using its own rules in maritime disputes with Brunei, Malaysia, Taiwan – and possibly Indonesia over the Natuna Sea. But the ousting of Prime Minister Yingluck Shinawatra has left the Thais and ASEAN rudderless as China tried to defend its stationing of an oil rig on Vietnam’s continental shelf. As Vietnamese and Chinese ships jostled and fired water cannons at each other – the best ASEAN could do was issue another summit statement urging restraint and expressing “serious concern,” timidly avoiding any mention of China. Furious protesters have trashed 15 Chinese factories in Vietnam, forcing Chinese investors and tourists to flee across the border and into the safety of Cambodia. Golfers in Danang reported fighter jets overhead, heading out to sea. Observers said it was the first time Vietnam had allowed the state-run press to freely cover the protests, which the government also allowed to proceed. However, Singapore-based Channel News Asia was taken off the air after flagging a report on the protests. At least 200 people have been arrested and the Vietnamese government has pledged to crack down on hooliganism. “It is clear that China’s new assertiveness is triggering anxieties among its neighbors,” said Ernest Bower, of the Center for Strategic and International Studies. ASEAN has long been ridiculed as a toothless tiger and its behavior amid the current standoff between China and Vietnam – perhaps the greatest challenge to face the group – only reinforces the claims. If ASEAN genuinely wants to be taken seriously, now might be an appropriate time for a united public front on China’s territorial ambitions in the seas that divide the bloc’s 10 nations. If it is unable to do that, then individual member states face the daunting task of dealing with Beijing on their own, further relegating ASEAN to the political sidelines and undermining its diplomatic credentials. A recent name change is rooted in deeper disagreements between Jakarta and Beijing related to the South China Sea. South China Sea Dispute Overshadows ASEAN SummitIt’s Time to Rethink Philippine Policies on ChinaIt’s Time for a New Philippine Strategy Toward ChinaIn Philippines, Pompeo Offers Major Alliance Assurance on South China SeaWhat’s in the Japan-Philippines Maritime Patrol Near the South China Sea?